SPOILER ALERT: This story will discuss the events of Game of Thrones' season eight, episode one. In the first episode of Game of Thrones Season 8, which streams exclusively on Foxtel, Arya Stark (Maisie Williams) gets an intriguing set up that has ramifications for the rest of the series. (This isn't a full recap of the episode, that will come later, as will our podcast, so do check back). 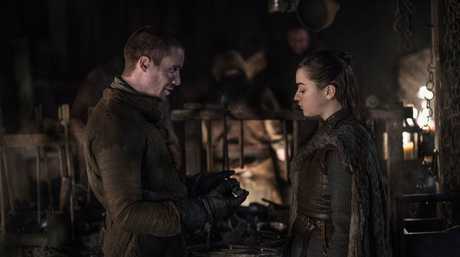 Arya reconnects with Gendry (Joe Dempsie) the blacksmith, her old travelling companion she last saw in Season 3. They had a cute dynamic way back in Season 3 (when he called her m'lady and she scoffed at him) that gets a sweet callback moment in this episode, when the two repeat that exchange in Winterfell's forge. But in Season 3, she was too young for it to truly be flirty. Not anymore. This is an important exchange for two reasons. First, it would be delightful if Arya, the so-called "tomboy" character got a love interest while her sister Sansa (Sophie Turner), the more traditionally "feminine" one, didn't. The sisters have often stood as opposing examples of what it means to be a girl in the brutal world of Westeros, and how to manipulate femininity, or shirk it, to survive. 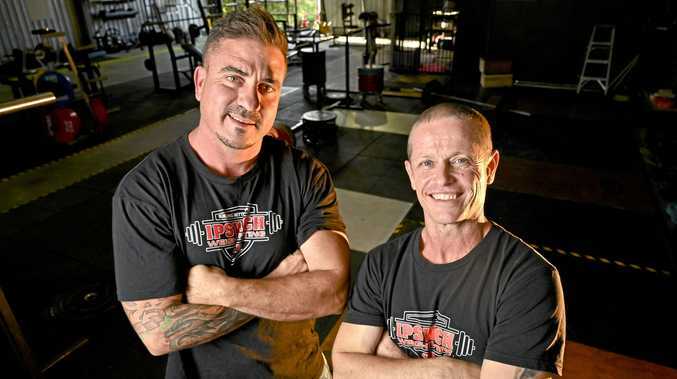 As they've grown up, both have come to realise it's not so black and white. But aside from the delightful surprise of its flirty vibe, the Arya and Gendry scene is significant because of what else they discuss. Arya gives Gendry a drawing of a weapon that she wants him to build using rare substances that can kill the zombie-like White Walkers. It has two parts, so it will function as a kind of javelin-crossbow, a weapon with longer range. Obviously this is a Chekhov's Gun that will be used in the future. The question is, how? 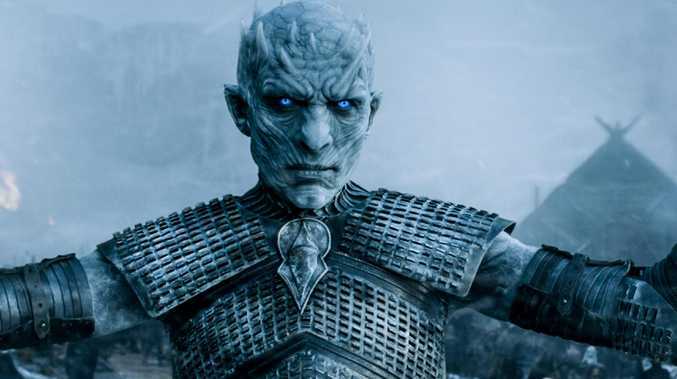 Many fans think Arya - not Jon - will be the one to kill the Night King. After all, Arya's storyline has revolved around death, so what better way to end it than to have Arya kill death itself, the king of the Army of the Dead? But that's not all. Earlier in this episode, Daenerys (Emilia Clarke) arrives at Winterfell, along with her dragons. While other northerners panic, Arya looks up with awe. The show deliberately takes time to linger on Arya watching the dragons. 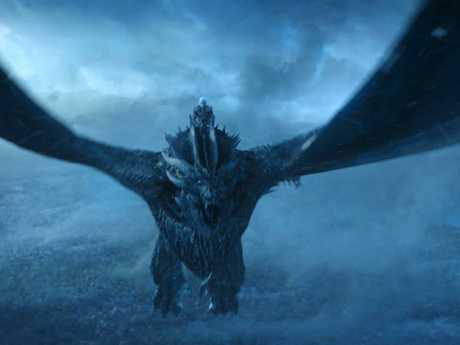 Remember, the Night King now has an ice zombie dragon. Recall also that throwing a weapon at a dragon from a distance can kill it. Bronn (Jerome Flynn) almost did this using a large crossbow in Season 7's "The Spoils of War", while the Night King felled his now zombie-dragon by throwing a lance in Season 7's "Beyond the Wall." So maybe, just maybe, Arya will use this mysterious long-range weapon to slay the ice dragon and knock the Night King out of the sky. A girl will kill death and the dragon he rode in on. Right before she goes on a date with Gendry. Because a girl can do both.